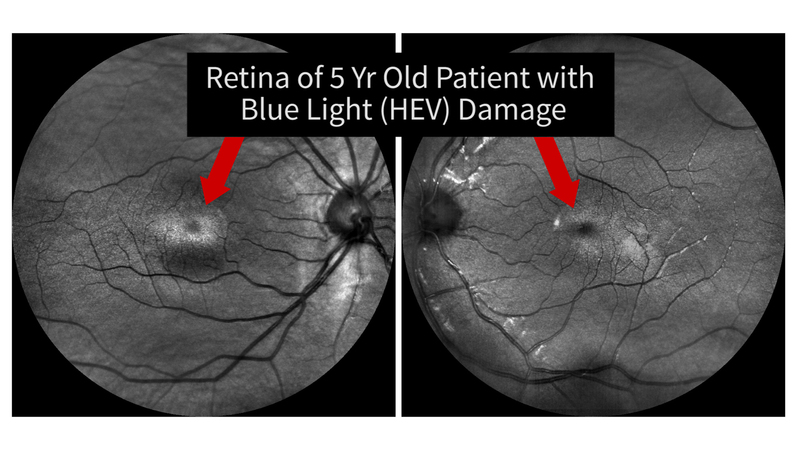 HOUSTON, TX--(Marketwired - December 08, 2015) - Concern is growing among U.S. Optometrists that up to 100,000 adults and children in the United States will become legally blind due to blue light, especially children five years of age and younger who play with electronic devices like computer tablets, according to Dr. Sophia W. Barnes O.D., a Houston optometrist. "Children are vulnerable because they have large pupils and pristine lenses," said Barnes. "The American Academy of Pediatrics states that no child under the age of two years should be on any computer device. And I would extend the limitation to children five years of age." Blue light is emitted by computer screens, laptops, notebooks, tablets, smart phones, LED lights and television screens. Blue light is the shorter wavelength of light called High-Energy Violet light or HEV. The most damaging HEV Wavelength is between 400 and 420 nanometers (nm). This is the most harmful wavelength to the retina, causing macular degeneration or macular re-modulation. The good news is that blue light damage is reversible if caught in time. In Japan, the risk to blue light has been resolved with the use of filters. Blue light filters are available in the United States and come customized for various devices from tablets to smart phones. Consumers also should demand that computer manufacturers and retailers add filters, such as Blu-Tech and Blue Light Defense lenses, with each computer device as done in Japan. In the U.S., Optometrists are focusing on early detection by using a new device, called the Easy Scan, to perform blue light screening of their patients as part of a comprehensive annual eye examination. An Optometrist nearest you with the Easy Scans technology can be found by visiting the website: www.EasyScantest.com. Dr. Barnes discusses the problem of Blue Light on a web-posted video. About Dr. Sophia W. Barnes, O.D. Dr. Barnes is the CEO of Vision Corner (www.visioncorner.com) in Houston, Texas. She is an independent scientist and not affiliated with any corporation or organization. She is motivated by a professional and personal concern for public health. Dr. Sophia W. Barnes, O.D.